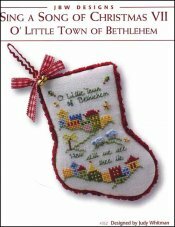 Sing A Song Of Christmas 7: O' Little Town Of Bethlehem [H1847] - $8.00 : Yarn Tree, Your wholesale source for cross stitch supplies. Cross stitch pattern by JBW Designs. "O little town of Bethlehem...." sing a long as you stitch this design! The city of Bethlehem is stitched with the verse, "O Little Town of Bethlehem, How still we see thee lie," stitched above & below. Look closely at the two small sheep walking down the hillside. Looking to give this design an extra embellishment? Purchase small gold stars to be added. Stitch count 47W x 67H. Stitched on #2181 Zweigart Belfast Linen 32ct. Antique White.